Cub Scouting creates a climate of cooperative and collaborative relationships between adults and children--a laboratory for adults and children to get to know one another. It provides opportunities for children to acquire the capacity for accomplishment. The program affirms to the child that the world really is an interesting place. The Pack is a group made up of several dens. The Pack includes not only the boys in those dens, but also their families, and their leaders. The Packs meets once a month with Cub Scouts, leaders, parents and other family members attending. The Pack meeting is the climax of the month's den meetings and activities. It gives the dens something to look forward to and work toward. This is a chance to recognize the boys, their parents, and their leaders. In addition to its regular meetings, the Pack sponsors certain special projects. These include community projects (e.g., a Thanksgiving Food Drive for the needy), outdoor activities (e.g., field trips, family camp outs, etc. ), fund raising activities, and fun competitions (e.g., Pinewood car Derby). The Cubmaster is an adult volunteer who serves as master of ceremonies at all Pack meetings and leads Pack activities of all kinds. Pack leadership positions may be held by women or men. The Pack Committee is a group of adult volunteers who plan the Pack program and individual activities as well as managing such things as record keeping, finance, leadership recruitment, and registration. The Pack Committee meets monthly and meetings are open to any interested parent. 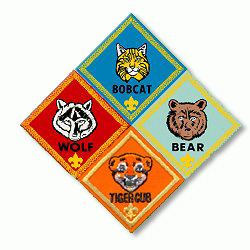 A Cub Scout Pack is divided into small groups of about eight boys called dens, who meet weekly under the direction of adult Den Leaders and, in some cases, Boy Scout Den Chiefs. The Den Leaders are trained parent volunteers. The den allows boys to get to know each other better and engage in activities that would be difficult in a larger group. The den also provides leadership opportunities for the boys as they elect "denners" or help to teach each other. THE ABOVE WAS TAKEN FROM PACK 1113 PARENTS' MANUAL, WASHINGTON, D.C.
Den Chief The Den Chief is a Boy Scout from a nearby troop who, usually, has achieved at least the rank of First Class. The Den Chief is a trained leader who assists a Den Leader in the running of a Den. It is the Den Chief's duty to assist the Cub Scouts in their den with the projects and activities of the Den. His duty also is to encourage, guide and protect them in all den and pack activities; and to show them by their example what a Boy Scout is. Webelos Den Chiefs also will work to interest the Webelos Scouts in becoming Boy Scouts. I promise to help the Cub Scouts (or Webelos Scouts) in my den to the best of my ability; to encourage, guide, and protect them in all den and pack activities; and to show them by my example what a Boy Scout is. As each Cub Scout completes the third grade, I will encourage him to join a Webelos den. As he becomes eligible, I will do all in my power to interest him in becoming a Boy Scout. The pack leadership consists of Den Leaders, Den Leader Coach, the Chartered Organization Representative, the Pack Committee Chairperson, the Pack Committee and the Cubmaster. These are adult positions. Let's look at what each one accomplishes in a Pack. For more information, see the section on the Pack Committee. The Cubmaster, who is sometimes referred to as the unit leader, is up front. Most parents think they run the show all by themselves. Now you know different. So what does a Cubmaster do? Plenty! Conducting the pack program which includes leading the monthly Pack meeting, with the help of the other leaders. Leaders complete Fast Start and Cub Scout Leader Basic Training. A Den Leader Coach Seminar is conducted for the leaders. Leaders attend the monthly roundtables. Leaders understand the purposes, policies and procedures of the chartered organization and the Boy Scouts of America. Help is available for new den leaders. Cub Scout leader recognition awards are available to the leaders. Monthly coach-den leader meetings are held to help plan den activities and programs. Information about the current and up to date program literature and material is passed on to den leaders. No den is ever without a leader and assistant. New den leaders are recruited. There is a communications link (usually the den leader coach) between the Cubmaster and the den leaders. Want to learn more? The major source for this information is The Cub Scout Leader Book. You may also wish to take a look at the Cub Scout Promise, Law and Motto which set the standards for Cub Scouts. You may also want to take a look at the History of the Boy Scouts of America.